This year marks Girl Scouts’ 100th anniversary Year of the Girl, and as part of that celebration Grand Junction is hosting the 2nd annual Cocktails & Cookie Creations April 20th at The Chateau at Two Rivers Winery. Eight of the valley’s most talented chefs will create one-of-a-kind savory appetizers using a famous Girl Scout Cookie as an ingredient. These creations will be formally paired with Colorado wine by Sommelier Monty Haltiner of Crossroads Wine & Spirits. The proceeds from this signature event provide programming for Girl Scouts throughout Western Colorado. It is the largest fundraiser for Girl Scouts on the Western Slope. US Bank has generously agreed to serve as title sponsor for this event, but lesser sponsorship opportunities are now available. Please contact Cindi Graves, Girl Scouts of Colorado’s Community Relations Manager on the Western Slope, at 970-628-8003 or cindi.graves@gscolorado.org for more information on how you can support Girl Scouts in our community. It’s no secret that it is Girl Scout Cookie time in Colorado. And Colorado’s many wonderful media outlets have been helping us get the word out. Here is a sample of some of our recent placements, as well as pictures taken at these media interviews. More media placements are coming in every day, and we will continue to add to this list so check back with us. Go Girl Scout Cookie time! Also been on KREX-CBS TV Grand Junction several times as well as Western Slope Communications Radio. Additionally been on several of the TV and radio stations in the Colorado Springs & Pueblo areas as well as radio stations in places such as Fort Collins, Salida, Steamboat Springs and Sterling. 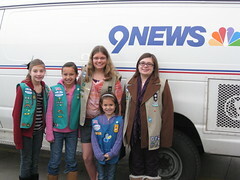 The Steamboat Springs TV 18 station also covered Cookie Time on Friday, Feb. 10th. Recognition for our hard work from Girl Scouts of the USA! 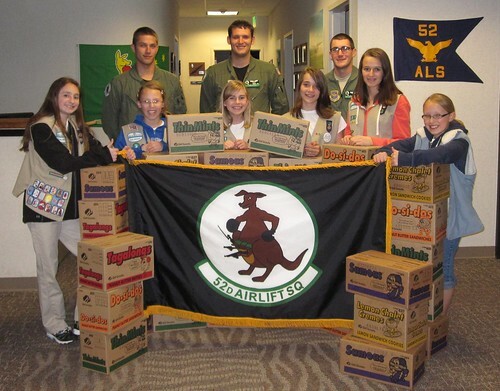 Troop 20, 5th graders at Lukas, ran the cookie rally for 120 Girl Scouts – K-4th grade – on Sunday, Jan. 15. The girls had help from high school Troop 33. The Juniors earned their Bronze Award by planning and running the cookie rally! It was all them! Nice job, girls! 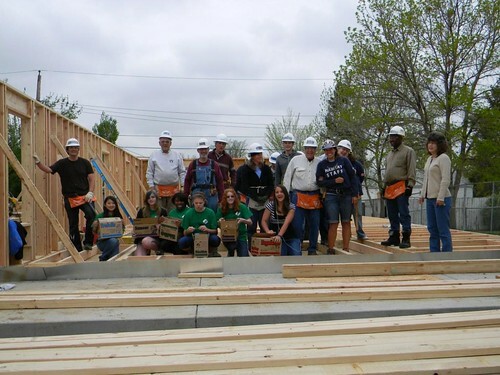 Our Girl Scout Cadette troop consisting of six girls decided to acknowledge the volunteers at Habitat for Humanity as our Hometown Heroes through the 2011 Cookie Program. The girls felt that the organization contributes to the community by helping people have a home of their own made them heroes. The troop collected 61 boxes of cookies and delivered them to a building site last spring, where they met with the volunteers working on the house. The girls were given a tour of the “home,” and a brief overview on blueprints and carpentry. The troop did not want to stop at collecting cookies, and expressed interest in contributing more to Habitat for Humanity. However, due to age restrictions, helping to build a home was not an option. So the girls investigated what Habitat needed and decided to try their hand at carpentry. They chose to build flower boxes. They spent their troop funds on supplies and a Saturday afternoon in the garage. They learned about carpentry and picked up a few power tools! The troop built five flower boxes. This fall, our troop was invited to participate in a home dedication on September 11, 2011 in Aurora, Colo. The girls went shopping for flowers and potting soil so the homeowner could plant the flowers in the boxes. The troop toured the finished home. They were amazed to see the finished product, thinking back to the building site they visited in the spring. All this started with blueprints and wood, combined with the hard work and dedication of the many volunteers at Habitat for Humanity! The troop was very proud to be a part of the dedication ceremony and were given a moment for our Troop Cookie Director to say a few words. The girls placed the finished flower boxes on the porch railing to give the homeowners something to add to their new home. “It was great to do something for all of the volunteers that work so hard to help other people. I am happy we could help and make a difference in the life of another person,” explained Rachel, a Girl Scout and member of Troop 640. Our troop discovered many things about themselves, the community and the world through this service project. But the thing that stood out the most for them is that there really is no place like home. St. Mary’s 3rd Grade Girl Scout Brownie Troop 263. bottom row left to right: Caitlin E., Isabelle C., Caitlin W., Lindsey B. second row left to right: Allison N., Bridey S., Anika R., Katie H., Alyssa B., Kendall M. top row left to right: Becca P., Courtney C., Samantha M., Natalie P., Raegan B., Colette B., Sarah E. top row left to right: Troop Leaders Ila R. and Sheila M.
On May 10, 2011, members of St. Mary’s 3rd Grade Girl Scout Brownie Troop went to Fort Carson to deliver 291 boxes of Girl Scout Cookies to the 3rd Brigade Combat Team – 4th Infantry Division! The 4th Infantry Division is a modular division of the United States Army based at Fort Carson, Colorado, with four brigade combat teams. It is a very technically advanced combat division in the U.S. Army. Every year during Girl Scout Cookie Sales, troops are allowed to choose a non-profit organization to receive donated cookies. Some customers of Girl Scout Cookies do not want to buy cookies for themselves, but with the Hometown Heroes program, customers have a chance to give to others and support Girl Scouts at the same time. Girl Scout Troop 2635 chose the 3rd Brigade Combat Team – 4th Infantry Division as their Hometown Heroes. We extend a special thank you to the leaders, Sheila Monkarsh and Ila Rosengarten, for their outstanding leadership to the girls, as well as our appreciation to Karyn Byrne for making the visit to Fort Carson and meeting Commander Lieutenant Colonel William Edwards with the troops happen. Commander Lieutenant Colonel William Edwards recently returned from his third tour of duty in Iraq, the most recent tour lasting 12 months. Great job Troop 2635!